The robust handset built to stay protected in life’s many situations. The Gigaset E49H is the tough handset from Gigaset. Resistant to water splashes, shocks and dust, it can survive in any environment, from the most hectic of homes to the dustiest of workshops. 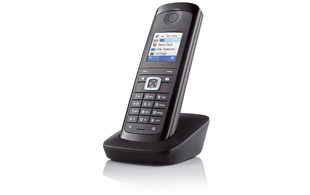 Easy to handle, this handset has an illuminated colour display and keypad for faster navigation. Thanks to a vibracall setting, it even vibrates to let you know a call is coming. Speaking is a pleasure on the comfortable handset. Or when you need to do two things at once, you can experience advanced hands-free with great sound quality or use the helpful headset connection via 2.5mm jack. With talk-time of 12 hours and an extra long standby time of 250 hours, the Gigaset E49H is simply dependable. And if you pay attention to the environmental and financial impact of your energy use, you’ll be pleased with the Gigaset E49H’s radiation-free and energy-saving ECO DECT technology. With ultra practical features and a durable outer shell, the Gigaset E49H is the steadfast handset that withstands the vigours of even the most demanding days.